Bo, also commonly referred to as Bo Town, is the third largest city in Sierra Leone by population (after Freetown and Kenema) and the largest city in the Southern Province. 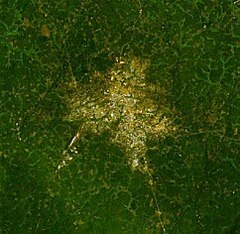 Bo is the capital and administrative center of Bo District. The city of Bo had a population of 149,957 in the 2004 census and had population of about 175,000, based on the 2015 national census. Bo is an urban center, and lies approximately 160 miles (250 km) east south-east of Freetown, and about 44 miles (71 km) to Kenema. Bo is the leading financial, educational and economic center of Southern Sierra Leone. Bo was previously the second largest city in Sierra Leone by population, However, Kenema over took Bo in population after the 2015 Sierra Leone national census. The city of Bo is one of Sierra Leone's six municipalities and is locally governed by a directly elected city council, known as the Bo City Council, headed by a mayor. The Mayor and members of the Bo City Council are directly elected every fours years in a municipal election. The current mayor of Bo is Harold Logie Tucker of the Sierra Leone People's Party, who was elected mayor with 69.7% of the votes in the 2012 Bo Mayoral election. Bo is one of the most ethnically diverse cities in Sierra Leone. The city is home to a significant population of many of Sierra Leone's ethnic groups, with no single ethnic group forming a majority. Bo is the principal home of the Mende people, who form the plurality of the city's population. The Krio language is by far the most widely spoken language in Bo and is used as the primary language of communication in the city. The city's population is religiously diverse, primarily among Muslims and Christians. Centrally located, Bo lies on the main rail line east and south of Freetown which was closed in 1974. From 1930 until independence in 1961, it was the capital of the Protectorate of Sierra Leone. The city is the administrative centre of the Southern Province. After Freetown, Bo is the leading transportation, commercial, and educational centre of Sierra Leone. Bo began its modern development with the coming of the railroad in 1889 and became an educational center in 1906, when the Bo Government Secondary School was established. The inhabitants of Bo are known for their resolve, resistance and hospitality. The town was named after its generosity. An elephant was killed close to what is now known as Bo Parking Ground. People from the surrounding villages came to receive their share. Because the meat was so large, the hunter spent days distributing it and the words "Bo- lor" (which in Mende language means "this is yours," with reference to the meat) was said so much that the elders and visitors decided to name the place Bo. "Bo-lor" in Mende also translates to "this is Bo." Like virtually all parts of the Southern Province, the city of Bo is a reliable political stronghold of the SLPP, the main opposition party in Sierra Leone. The SLPP had won every Sierra Leone presidential elections in the city and the rest of Bo District by an overwhelming majority. The SLPP had also won virtually every parliamentary, and Local government elections in Bo by an overwhelming majority, including the most recent Sierra Leone general elections held in November 2012. With assistance from the Revenue Development Foundation Bo City Council has started to collect property taxes. Like the rest of Sierra Leone, Bo has a tropical climate, more specifically a tropical monsoon climate under the Köppen climate classification, with a rainy season from May to October and a dry season from November to April. Average annual precipitation varies with up to 5,080 mm (200 inches) in the wettest parts. The prevailing winds are the SW Monsoon during the wet season and the northeastern Harmattan which is a dust laden wind from the Sahara Desert during the dry season. Average temperature ranges in Bo are from 21 degrees Celsius (73 degrees Fahrenheit) to 31 degrees Celsius (88 degrees Fahrenheit) all year. Bo has an ethnically diverse population, although the Mende make up the largest ethnic group. The city is home to a significant numbers of many of the country's ethnic groups as well as a large Liberian community. The population of the city is about equal in numbers between Muslims and Christians. In 1981 Bo District formed a 'One World Link' (OWL) with Warwick District in the UK. This was inspired by a desire for justice, equality, human understanding and mutual support. Over the years it has helped to strengthen both communities and their awareness of global and development issues. The many outcomes of the link include women's groups, school links, an online archive, an education programme and the opening, in 2008, of a Community Centre in Bo city. Immediate plans include collaboration on a pilot environmental programme for the collection and disposal of waste. There is also a youth wing which has 20 registered youth groups, that serve over 1,000 young people. The Bo District Development Association (BODDA - UK) was formed in the United Kingdom on 7 September 2003 by a group of natives from Bo District in Sierra Leone. The primary purpose for the formation of this organization is for its membership to explore every possible lawful avenue to solicit generous donations in cash, food, clothing, educational and agricultural. Bo District Development Association has been involved in various projects including sponsorships in Sierra Leone and the UK, for example the introduction of the BODDA Civic Award in which the people of Bo are annually awarded for their contributions towards nation building and community development (this is an effort to encourage the people of Bo in national development and citizenship); donation of two hundred computers and other school materials to various schools in Bo in 2007; donation of medical equipment to the Bo Government Hospital and books to the Bo Regional library in January 2010. In August 2006, in partnership with the British Council Sierra Leone, they were able to facilitate a one-month tour for six artists from Bo with the aim of promoting awareness of global issues through music and encouraging global citizenship through the linking of youth groups in the UK and Sierra Leone. The Organisation also awards scholarship to students from poor family backgrounds who are unable to meet their educational needs. As in most parts of Sierra Leone, the Krio language is widely spoken in the city Bo, although English is the official language spoken at schools and government places. The Mende language is also widely understood by the city's residents. Bo has one of the highest literacy rates in Sierra Leone. The city is home to Bo Teacher's College, and hence to many primary schools as well as several secondary schools, including one of the elite secondary schools in West Africa, The Bo Government Secondary School (commonly known as Bo School). Bo school was founded in 1906 by British educationist Leslie Probyn to educate the children of Bo Town. The school has a long history of producing the elite of Sierra Leone, especially the country's top politicians. It is situated on 5.5 hectares (13.5 acres) of land in the heart of Bo Town. The school itself is situated in pleasant surroundings and within walking distance of the government hospital, government post office, police station, and the main shopping center of Bo Town. A football field, volleyball court, basketball court, long tennis court, and cricket pitch enrich the recreational facilities the school provides. There are plans to rehabilitate the school swimming pool. Bo School also maintains a unique tradition of seniority which has consistently augured well for social cohesion among the students. Maggots/Greeners/Rustics are either junior or newer members of the school (specifically those with more recent admission numbers). They are expected to always observe all rules of deference association with their positions and comply fully with specific instructions from senior students. Bo is also home to the Bo Teacher's College, and the newly built Bo Industrial Growth Centre, one of Sierra Leone's largest vocational school, which was officially open by Sierra Leone's president Ernest Bai Koroma in April 2013 . Bo is the second most important city in Sierra Leone, after the capital Freetown. The two main local radio stations in Bo are Kiss FM 104, and Radio New Song 97.5. The local service of the national broadcaster, SLBS, transmits on 96.5. Commercial station Capital Radio uses 102.3 and BBC World Service also has an FM relay. Like the rest of Sierra Leone, football is the most popular sport in the city. Bo has two football clubs in the Sierra Leone National Premier League, Bo Rangers, and Nepean Stars. Both clubs play their home games at the Bo Stadium. Another club from Bo Town called the Kakua Rangers plays in the Sierra Leone National First Division, the second highest football league in Sierra Leone, after the Sierra Leone National Premier League. There are several clubs from Bo Town in the lower divisions of Sierra Leone league system. Since the end of the civil war in 2002, there has been an increase in homicide, armed robbery, home invasion and carjacking in Bo Town. Petty crime and pick pocketing of wallets, cell phones, and passports are very common in the city. Over the past year, criminal exploits have become more aggressive; increasingly operating in numbers and using weapons. Like in most West African countries, local criminals target expatriates due to their perceived wealth. Bo Airport serves the Bo District and the Southern Province. The airport is no longer in regular use. There are other towns in Sierra Leone with the same name. ^ Republic of Sierra Leone: 2004 Population and Housing Census: Analytical Report on Population Distribution, Migration and Urbanisation in Sierra Leone. Ibrahim Mohamed Sesay, Andrew A. Karam, Jinnah J. Ngobeh. Published November 2006. ^ "Bo Climate Normals 1961–1990". National Oceanic and Atmospheric Administration. Retrieved April 1, 2015.